This is the third of four posts published in the run up to the One Team Government unconference on 29 June 2017, where a bottom-up community of digital and policy officials in and around the UK government are coming together to learn more about each other’s work and to explore how these roles are starting to merge. The first post was a crowdsourced reading list for policy officials interested in digging deeper on digital, which is posted on GitHub to allow updates and new recommendations. The second was a guide to policy for digital professionals in and around government. Drawing on my experience working across the space between policy and digital (and data) in government, this post reflects on what each of these professions might best learn from the other. The policy profession has not been immune from criticism over the years, but the rapid emergence of digital and its transformative impact both inside and outside government has highlighted new challenges alongside more familiar complaints. One of the unstated myths of policy is that there is a presumed directional hierarchy at work in civil service activity: a process that starts with a vision or particular details from ministers, refined through options and analysis from policy officials, with decisions then flowing on through into a handover to those in operational professions who implement those decisions. Although the process is often formally presented as a circular process (eg the HM Treasury Green Book ‘ROAMEF’), the circular link in the chain has always been understated, and any cycle is presumed to operate over a period of years or even Parliaments. It is the presumption of a linear, insular policy process that is perhaps most frustrating and alien to government digital teams. For digital teams the break from ‘waterfall’ project management to Agile processes with its rapid iteration of tangible products based on carefully assessed user need is not just about building effective digital services, it is an acknowledgement of the powerful cultural and behavioural shifts that have come about in the modern digital era. Policy’s frequent ignorance at the seismic cultural and practical shifts created as a result of the Agile Manifesto makes the profession look like it has not moved with the times when it interacts with digital, even though good quality policy has always involved flexibility, iteration and a deep understanding of its use and impact in the real world. The digital world often moves with incredible speed as it develops services, with tangible prototypes and alpha versions of products sometimes produced within days, not years. In the the meetings-based culture of policy it is not unknown that during the period waiting for diaries to become free to discuss the basic premise of the service, the digital team have already produced a basic product. The contrast can be infuriating. The gap between policy and operations has long been criticised by Ministers and senior officials alike (“very, very poor connections between policy advice and delivery experience, so often policy ideas are put forward in the absence of any understanding whatsoever in how you actually deliver anything”), and the privileged position of policy ‘above’ other disciplines in government breeds a common criticism that policy would rather engage in the intellectual pursuit of ideas and writing rather than the ‘dull’ functional agenda of managing people, buildings and contracts. There is perhaps not a little irony that as policy officials specialise and develop skills in other areas there is a fear among the profession — and some Ministers — that they are losing their core ability to reason, write and craft a quality briefing note and communicate in a sophisticated way with Ministers. There is also a common complaint from digital that policy can appear to lack clarity or sometimes even an interest in its end-users and what drives their experience of a situation or service. Good policy makers will always have gone out and experienced operational delivery of services and talked with and observed citizens interact with services, and there is an important challenge to digital’s presumption that government is built on transactional services and individualistic relations between government and users, and this is addressed in the section below. But too often policy’s engagement with users is not done frequently or routinely, and it is almost never done with the serious intent and methodology seen in the practice of designers and specialist user-researchers. Nor is there anything like the basic presumption and hunger for end-user feedback seen in digital working practice. When introduced to these techniques through the work of Policy Lab or through close working with digital colleagues it can be surprising how intense the positive reaction from policy officials can be, and how shocked colleagues are that have not embraced these quite basic and widely used design techniques before. From a digital point of view the central focus on user needs leads to a common desire to turn the traditional policy making process ‘on its head’, as Mike Bracken said his critique of policy making in government, and to radically improve its pace and rhythm. Compared with the rapid iteration of digital products, policy is slow and inflexible, and at times it can appear to fetishise complexity rather than reward the hard work it takes to make thing simple — a deeply felt principle among design professionals. The thinking goes: if user needs have identified an unintentional policy or legislative barrier to improving a service, how can it take such a long process of green and white papers, formal consultations and possibly legislation to make a change? Even if some parts of the process like legislation are unlikely to speed up any time soon we should be able to develop processes that start with a Ministerial mandate and which, through prototyping, flow rapidly around the cycle as services iterate, and flow in all directions. 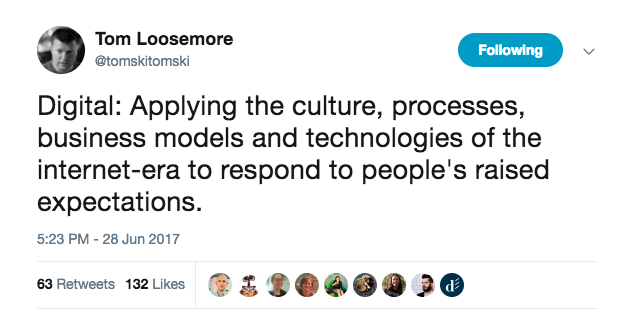 We should start with the expectation that policy changes will come flowing upwards as digital service delivery interacts with users, and policy decisions should routinely be seen as moments that establish a prototype and are merely the start of an iterated process, not the final end-point of service design. All organisations carry with them their own culture and assumptions about how best to intervene, and the civil service in general and departments specifically are not immune from this. Some departments tend to reach for legislative solutions to new challenges, others to a new programmes and a ring-fenced pot of money. While in theory we bring the right tool to each job, in practice there are often unconscious assumptions in play about what sorts of activity are deemed appropriate. Digital teams are often fresh faces in a department and bring a different organisational culture. They can be quick to spot these cultural blindspots at work in a department, and not just those related to a lack of technical understanding and digital ways of working. Calling out these assumptions can feel threatening to others in a department, even when done with benign intentions. At times policy and other more established civil service professions can be reluctant to rock the boat and can value process over outcomes, complexity over clarity, general knowledge over deep technical skill. Phrases like ‘we tried that before and it didn’t work’ delivered with a roll of the eyes can sap the energy of reformers in government regardless of their profession. And generalists too often act as an intermediary between those with specialist skills and decision makers — we need to quickly move to a position that individuals with deep digital delivery skills are present in senior decision making meetings with Ministers or senior officials. The assumption that policy work has to mean closed working in private can be particularly testing for digital practitioners, where the shift towards open source development happened a couple of decades ago and where collaborative tools like StackOverflow and GitHub are near ubiquitous. The GDS design principle of ‘make things open it makes them better’ is not just practical advice, it reflects a broader cultural approach and set of implicit behaviours. A combination of the UK’s adversarial political system, the ultimate accountability of Ministers to Parliament, and a healthy desire to protect safe spaces around Ministers to enable the debate of controversial options means that there has been a reluctance for policy officials to engage too broadly or visibly in policy debates. On controversial political issues this can be sensible — the social media guidance from Cabinet Office remains a good guide to navigating this sometimes difficult territory. But the assumptions about working on policy only in private are being challenged, not least through the movement towards open policy making and with leadership from the Cabinet Secretary Jeremy Heywood who has challenged the presumption that policy officials have a ‘monopoly on wisdom’, and from Chris Wormald the head of the policy profession in government and Permanent Secretary who when at the Department for Education introduced five policy tests for officials that included the provocative question ‘who made you the expert?’. A more collaborative policy mindset does not have to mean doing everything in the open, and there are good examples from departments like the Foreign and Commonwealth Office where security and discretion are critical. But old habits persist, occasionally with strong Ministerial support. In general there remains a gulf between the type of open problem solving seen from mainly digital teams in around 100 government blogs and the day to day activity of most policy civil servants. For digital teams this not only looks like an inefficient way to solve problems but it looks arrogant and insular, with a suspicion that information is withheld as a form of control and power. And it can make policy officials look like they are hiding from view, wary of personal accountability and responsibility. Digital disruption is not a straightforward incremental process and new paradigms can mean leaving some sensible ways of working behind. So be it. This blog post doesn’t argue for the policy/digital equivalent of ‘wagile’ (the often unfortunate marriage of waterfall and agile project management approaches). Half reforming is a strange ambition. That said, while government is spending serious effort getting the mainstream civil service to understand digital there seems much less out there on what the digital professions can learn from policy, and for those of us that straddle these two professions it feels like there are some blind spots that need recognising. One of the most perplexing features for policy officials working with some digital colleagues is the overwhelming focus on the transactional services government delivers, compared to more collective government activity. Transactions are where an individual wants something from government and for example goes online to sort it out. The challenge to fix transactions led to GDS’ Transformation Programme of 25 exemplar digital services in 2013. The result has been a massive uplift in the citizen’s experience of these services alongside a significant reduction in costs. It needed fixing, and the experience of many digital colleagues who have similarly revolutionised improvements to services in the private sector has been invaluable. But government is as much about ‘we’ as ‘me’. The basic purpose of state intervention is ‘usually founded either in market failure or where there are clear government distributional objectives that need to be met’, often in instances where the issue in question raises societal interests beyond an individual. For example, the policy choices around the programme of interventions for individuals convicted of crimes to prevent reoffending is a mixture of interests of the individual in question, their family and friends, neighbours, and the taxpayer. Similar issues are in play when working out whether to embark on a major infrastructure project like HS2, and if so where to locate it; deciding whether accountability regimes in policing, education or health are appropriate and whether change could improve outcomes for citizens; and dealing with so-called troubled families. There seem few big government decisions that don’t involve positive or negative externalities of one type or another. Working out how to identify and then manage tensions between competing interests in these situations is a mainstay of policy work in government. It is not just the gravitational pull towards transactions and away from more messy government activity that can be a frustration for policy officials. It is that digital teams who are grounded in engineering products can make policy decisions on the fly, sometimes without realising, and often without being familiar with the basic policy processes to work through different options. Decisions that can just look sensible or efficient can miss bigger policy and political issues, especially when they have repercussions on citizens outside a narrow definition of ‘user’, when speed of delivery is paramount, and when digital teams can at times have an overly homogenous outlook on life. Learning how to identify hidden ideologies located within product choices and dealing with competing possibilities and ideas is perhaps one of the remaining benefits of a liberal arts degree in a digital government world. There is also an implication for our adherence to the centrality of user needs when the collective purpose of government is acknowledged. The digital revolution in services and products in our wider economy has been founded on a relentless focus on user needs, and in government the first digital design principle has acted as a critical call to action against self-regarding producer interest and civil service insularity: ‘user needs not government needs’. But this presupposes a binary between individual recipients of services and a self-serving bureaucracy, and it does not make space for recognising collective citizen interests that flow from externalities. Ultimately, it may be that user needs are necessary but not sufficient within a wider government context, and that ‘citizen needs’ could be a better focal point. There is a risk that an overly narrow focus on the user in situations where there are contested moral, political and social choices (divorce, benefits, criminality etc) can lead to naive conclusions. It is a paradox of modern digital government that despite the deep civic mindedness of many of the individuals involved, the individualistic, transactional mindset that drives the digital economy can at times seem to override a more collectivist, social perspective. Collective citizen concerns are not an edge case, and a perspective that is reluctant to put an individual citizen and their individual control at the centre of a digital world is not always a sign of a bureaucracy interested in furthering its own agenda or failing to appreciate the significant insights from user needs analysis. Policy professionals also have a range of other skills highlighted in the previous post that can be invaluable in making progress in government, and which are sometimes lacking in digital teams. For example, working through competing upstream options, judgement in intervening in political or contested environments, managing ambiguity and exercising nuance in dealing with organisations and people, and — occasionally — busting through hype and technological solutionism with a healthy dose of scepticism. There is also an important but frequently misunderstood skill in creating the right amount of distance between an individual and the content they are working on. While there are few things more frustrating than the cold aloof civil servant seemingly indifferent as to whether the issue they are working on succeeds or fails, there is something to be said for striking an appropriate balance and drawing on a realist and sometimes sceptical approach. The civil service serves whichever Ministers the public choose in general elections, and one of the unusual features of the job is that this can mean having to pivot in the opposite direction with the same degree of enthusiasm and commitment — a psychologically odd process that is mitigated through our strange ritual of preparing first day briefing packs for new ministers. Of course, not everything changes overnight with the appointment of new ministers or a new government, and this is usually more true the closer one gets to operational delivery roles. But there is something about the infectious passion of digital colleagues who are newer to government that can at times start to feel like the all-conquering belief in user needs is being mistaken as a ‘factual’ proof of what has to change. Democracy is our best corrective process to manage the full range of views, emotions, needs and hopes of the country; and it is profoundly bigger than user needs. Many of us fight daily to improve the process of government so that it can speedily and accurately bring the user perspective close to Ministers and other decision makers in government. But sometimes Ministers will make a decision that does not seem to reflect this ‘rational’ insight established from user needs, and that is absolutely fine. All civil servants — digital practitioners included — need to be utterly committed to implementing those decisions. A number of us have too often witnessed times when ‘user needs’ that coincidentally reflect the views of the individual in question have been used as an excuse for why a thing can’t or must happen. Ministers understandably have a deep antipathy to civil service interests trumping legitimate democratic decisions, even (especially?) when these are framed as empirical knowledge of what citizens need. The next post in this series will look at how we can bring policy and digital together in a more seamless way of working and develop a prototype for a One Team Government manifesto.